A new report of the International Resource Panel evaluates the relative environmental merits of power generation options. I am co-editor of the report and lead author of the chapter on wind power. In this blog post, I share some insights from the report as well as own reflections on environmental aspects of wind power. Wind turbines are driven by the energy possessed by moving air – that is, wind. In fundamental contrast to exhaustible energy stocks like oil and gas, wind is a renewable energy flow. What is more, it is available in ample quantities around the globe. Still, wind power deployment is not without environmental concerns. First, comprehensive life cycle assessments are conducted to quantify environmental impacts, such as climate change, toxic effects and air pollution. Second, some impact types are essentially non-quantifiable, as agreed-upon methods for quantification do not exist. The report addresses such impact types by means of a qualitative discussion. Examples of non-quantifiable effects of wind power include bird mortality and visual intrusion in landscapes. 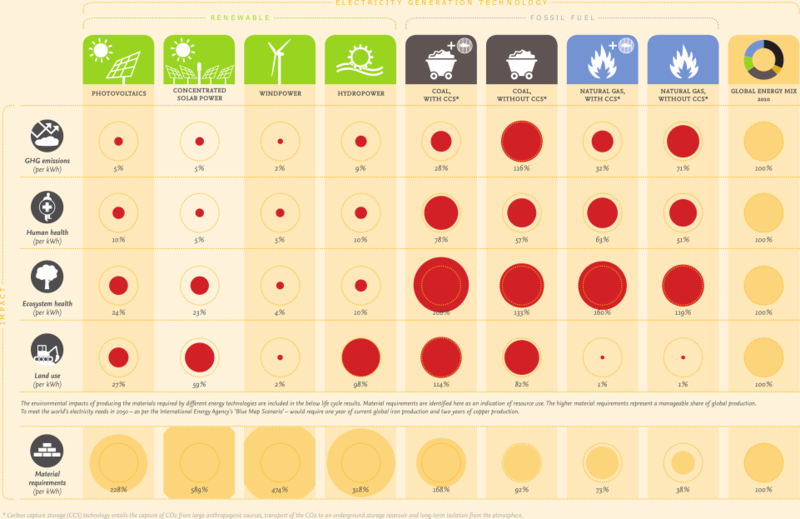 Overview of life cycle impacts for different power generation options. Source: Hertwich et al. (eds.). Green Energy Choices. Summary For Policy Makers. UNEP International Resource Panel. The summary report is available here. In a life-cycle perspective, wind power causes harmful emissions, just as does any other way of power generation. Looking at the life cycle assessment results of the IRP report, one result is striking: Wind power shows excellent performance by all the assessed impact types caused by pollution, outperforming the global electricity mix by one or two orders of magnitude. This is evident from the figure above, showing a comparison of estimated impacts for different technologies. (I am afraid image size is small. You may click on image to increase size somewhat, or see the IRP summary report.) Observe, for example, that the greenhouse gas emissions of wind power amount to only 2% of that of the average global electricity. Similarly, wind power causes adverse effects on human and ecosystem health (due to air pollution or toxic contamination of soil and water) corresponding to 4-5% of that of the global electricity. Try a Google search for “wind”, “birds” and “myth”, and you will find websites portraying wind turbines as a major threat to birds. And you will find websites presenting it as a myth that wind turbines is a significant threat to birds. Such contrasting perceptions probably come about for a variety of reasons. It is clear though, that one explanation is that some people look at the total number of birds killed by wind turbines in comparison to buildings, transmission lines and cats, while other people focus on effects on local bird populations. The former perspective tends to put wind power in a more favourable light, because – true – in the aggregate wind power is only a minor bird-killer compared to other man-made structures. The latter perspective tends to put wind power in a less favourable light, because – also true – wind farms can do harm to local bird populations that are small or vulnerable, or valued by humans. Wind turbines tend to kill different types of birds (for example, eagles) than buildings (for example, songbirds). Measures exist for reducing the risk of bird collisions and have demonstrated some success, which is encouraging. Perhaps in particular, careful spatial planning and optimized wind farm siting can reduce negative effects on birdlife. Not to forget, there is also another (and very different) type of flying animals, bats. For reasons not entirely understood, some bat species seem to be attracted to wind turbines – putting the bats at increased risk of injury or death caused by moving turbine blades. There are concerns that wind turbines have become or are about to become a serious mortality factor for bats in some regions. How much land area does a wind farm occupy? Here also, views differ greatly. For the IRP report, a choice was made to count only the area used exclusively by turbines with foundations, and access roads. The basic reason for this choice is that the spacing between turbines can be used by humans for other purposes or by terrestrial wildlife. A wind farm area can, within some limits, coexist with agricultural crops, animal grazing or wildlife. The same cannot be said for the land used by open-pit coal mines or bioenergy crops. With the approach used in the IRP report, the life cycle land use associated with wind power is very small compared with competing technologies, as is evident from the overview of impacts in the figure above. However, as is discussed in the report, a much larger area could also be regarded as impacted, especially because wind turbines are tall structures that may be visually dominating in landscapes. Concerns about degradation of scenic attributes of landscapes can be legitimate, and should not generally be dismissed as a “not in my back-yard”-type problem. Life cycle assessments and other literature often assume, explicitly or implicitly, that one unit of wind power delivered implies one unit of fossil fuel-based power avoided. I have some reservations concerning this. First, I am currently not able to see a basis for a priori assumptions that wind power deployment automatically reduces fossil fuel power use on a one-to-one basis. Second, it appears to be an artificial premise that wind power competes solely with fossil fuel power. It could also be seen as facilitating growth in electricity demand or as competing with other renewable options or with energy efficiency, especially in a future-oriented context assuming high carbon prices. The IRP report shows that wind power has a great potential for reducing greenhouse gas emissions and other pollution. At the same time, realizing this potential depends on the degree to which fossil fuels are displaced. This again depends on energy and climate policies whose combined effect is to avoid fossil fuel use. The full report, including the chapter on wind power, is available here. A summary report is available here. Other materials related to the report are available from http://www.unep.org/resourcepanel. A Norwegian version of this blog post is here. Thank you, Anders, for your post. We have been recently discussing with my colleagues a similar issue – avoided impacts of biofuels production. It’s the same story there, i.e. to what extent biofuels actually replace fossil fuels? * Do they replace any fossil fuels, or only add to the total consumption of fuels? * Even if one unit of energy in biofuels in reality did replace a unit of energy in fossil fuels, and the consumption of fossil fuels did gradually decrease, for how long that 1:1 displacement will be valid? * If in the (distant) future there will be no cheap fossil fuels available (either due to policies, or economy) then biofules might become standard fuels and should not benefit in LCAs from the substitution credits. But then again, how should the substitution factor be defined if the 1:1 approach is not realistic? Any thoughts (or literature) on that? Yes, those are exactly the kind of questions we need to ask. I think your point that if biofuels become standard fuels they should not benefit from substation credits, is a good one. And arguably we are moving in the direction of clean energy becoming the standard. Historically, there has been a continuous shift from dirty to relatively cleaner fuels, even in the absence of any climate policies. In an LCA study of wind power that we did in 2011, we took IEA scenarios for the power sector as a basis, and made the assumption that additional wind power in the mitigation scenario, compared with the baseline scenario, replaced fossil fuel-based power. We then used the respective life cycle emission intensities of wind power and of the fossil power mix to attribute emission benefits to wind power. This gave much lower estimated emission benefits than if we had assumed 1-1 replacement. While we did attribute emission benefits to wind power, we did not make any claims about causality.